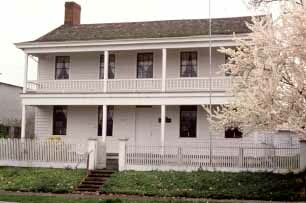 Monteith House, built in 1849, was Albany's first house and is one of Oregon's oldest existing structures. It was built by Walter and Thomas Monteith, who founded Albany after buying the land on which it stands from Hiram Smead for a cayuse pony and $100 cash. It has served as a private residence, a military headquarters, a storehouse, a trading post, and a meeting house. It was also the birthplace of the Republican Party in Oregon. Visitors to Albany can enjoy many of the city's histor ic homes during the Historic Interior Tour. Summer Hours: Wed-Sun, noon to 4 pm. Other times by appointment.